A little boy from Minecraft world is waiting for your help in Minecraft Platform. Because of being curious, he has decided to challenge his ability in a platform. However, it seems hard for him to get out of it, so you are going to lead him to the exit door which is green at each stage. In two first stages, there is only a green door, but other stages there are more green doors. Green doors sometimes are difficult to be found. 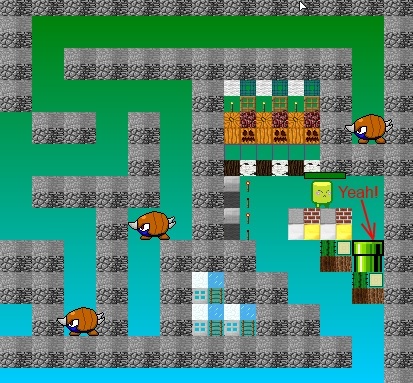 For example, in the first stage, he should move at the end of the platform to see the path leading to a green door on the right. In the final stage, he must face a violent hunter. At that time, he may need your clever skills most. Besides him, there are other creatures causing difficulty for him. They neither like to eat him nor use some magic to make him frozen. They only like to get in his way. To deal with these creatures, he needs to jump on their back to make them disappear. Minecraft Platform may help you relaxed and interested in searching green doors for the little Minecraft. + Players move the character with Arrows. + Space is used for shooting.